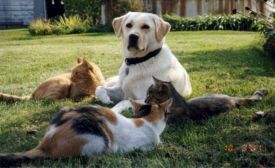 Oats was not only my buddy, she was mother & grandmother to all our dogs. She was my second hand when it came to farm work. I couldn't do my farm chores without her! She passed all her displaysia tests, was certified "Good" and had her eyes "Cleared" annually. This wonderful yellow female weighed in at a hefty 55 lbs and had a small solid build. 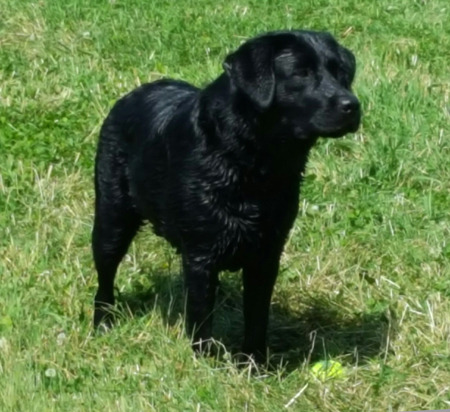 Oats had wonderful retrieving skills, targeted birds on the ground/air, loved the water, a lively mouse hunt and herded my young weanling horses and goats into the barn when needed. Bring out a gun, and she was ready to find the vermin! 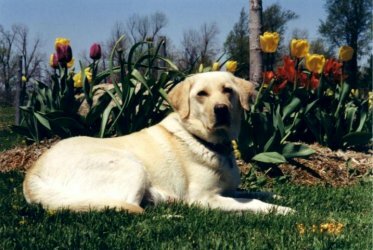 Oats produced her last litter - sired by the late, Mistyfield March To The Beat - on: April 18, 2005. There were 7 puppies: 4 boys and 3 girls. She LOVED being a mom! Thank you Oats for giving your all and leaving us with the most wonderful memories. Uno was the soul puppy of her litter; hence the name, Uno. She matured very quickly and loved playing tuggy with a rope and would carry her "prized" Wiggley Jiggley ball everywhere. Uno was a small dog weighing in at an average weight of only 5o pds. She was a super fast learner and felt iit was her job to stay with her person, no matter where they went. This was a wonderful asset when we started learning the game of agility. She took to it like it was water. What a run we had! When home on the farm, Uno enjoyed long swims in the dog pond where she would paddle around for hours watching dragonflies. When asked about going for a ride, she was ready for either the truck, car or the farm Prowler. Gosh the Prowler was a huge source of entertainment (for us humans) because in doggie language, it that meant we were going "Deer Hunting". God forbid if we saw one! 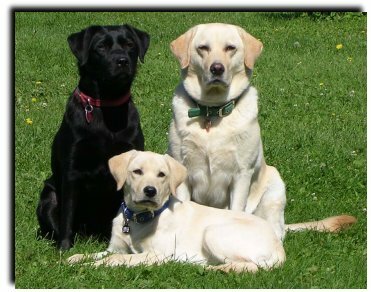 The Labrador pack would howl like a pack of Coyotes with Uno's high pitched squeal of excitement leading it! Uno produced 3 litters for us. One of these litters was a single birth, just like hers. 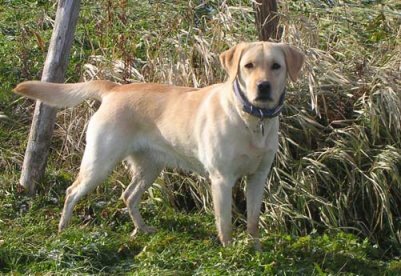 From her last litter (2009), we kept a yellow daughter, Island Dos. Dos is carrying on for her mother and reminds us everyday of just how special this side of the family is. Uno's Limited Show Record: Aug. 2006 - almost one year from her first agility lesson, she garnered both her AKC Novice Agility Titles in 20' division and one High Point Labrador Retriever Award (Standard Division) at: The Greater Boston Labrador Retriever Club trial! 2007 - Uno earned her AKC Open JWW Title and is one "Q" away from her Open Standard. 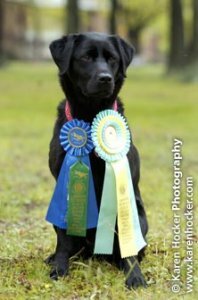 She received another, High Point Labrador Retriever Award (Jumper With Weaves Division) at: The Greater Boston Labrador Retriever Club trial, for the second year in a row! Way to go Uno! Trialing for the 2008 agility season was very light. High gas prices & large traveling distances were the main reasons. 2009 was another light year as Uno had a litter of pups in March. In the fall of 2009 Uno tried a few CPE Agility Trials. We both had a fun time, met a lot of new friends/dogs and earned a lot of "Q's". Uno even won a CPE title! 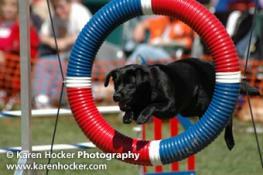 On April 23, 2011 at the BOTC Agility trial, Uno, at 8 yrs of age, finished her AKC Open Agility Title! 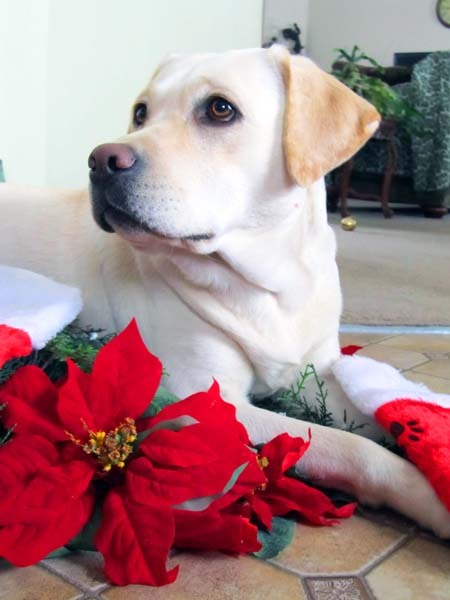 Her latest feat was earning her AKC CGC Title. 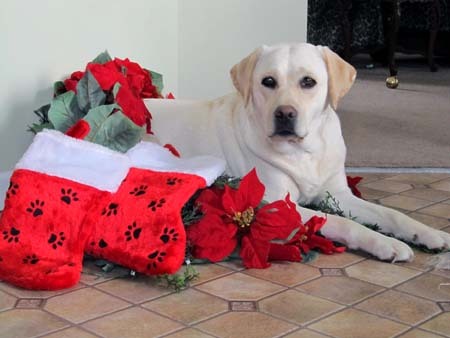 She accomplished this at the place of her training, Waggles LLC in Dec. 2012. 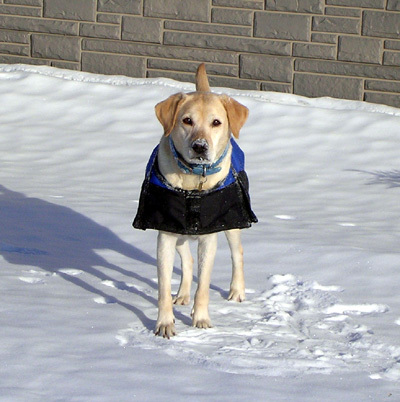 Sadly on Dec. 31, 2013 I had to say farewell to my wonderful Uno. She fought so hard and didn't want to leave but; God had decided to call her home. There was nothing I could do except honor His wishes and say good bye. Dog of my heart, Rest In Peace. I know you crossed the Rainbow Bridge like is was the Dog Walk! Mother Oats awaits you! And I, good Friend, will see again, one day. 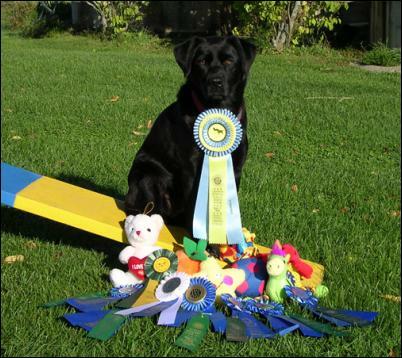 Uno and all her loot and ribbons she accumulated while earning her AKC Novice Agility titles. "Cute in my clothes, aren't I?" Hips & Elbows - OFA "GOOD"
Brie is a smart, quiet dog and a daughter of Island Harley - making her a granddaughter to our dearly departed, Oats. Brie is a sight to behold! She is not only a quick learner with a laid back disposition, she's an excellent retriever, enjoys long swims in the dog pond and adores a Saturday morning truck ride to the local store! Brie has a pretty head, nice length of neck, correct shoulders, short back and a tail that won't stop wagging! She has matured into a beautiful, very stout dog and weighs in at 60-65 lbs. She is what we were hoping to breed when we first started. She is the watch dog of the group and will alert us to anything that isn't right. Brie produced 3 litters for us. She has been retired from the whelping box. Her mother duties have been passed on to her daughter, Island Duchess.She does enjoy watching and playing with any of the puppies that are born here - as long as they don't take her Frisbee! 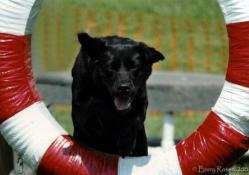 Dos was a daughter of our agility Champion, Island Uno. 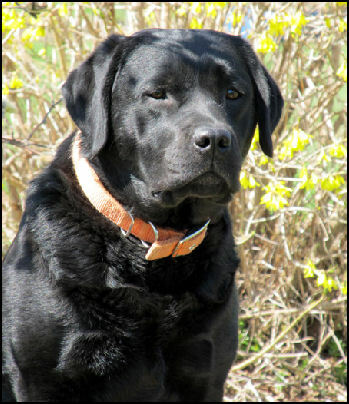 Dos's sire, was an AKC Champion who also had a Rally Obedience Title. One of the key factors in keeping Dos was the age of her sire and grandmother (Oats). We love our "Drummer & Oat" girls and wanted one more! Dos was a tad bigger than our other "Drummer" daughters but what a joy to behold! 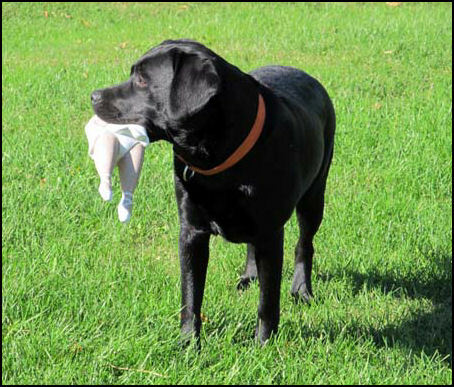 She was a great fetcher and toy 'thief' - which we believe she learned from her 1/2 sister Harley. Dos loved to swim, go for hunting runs in the fields, adored a truckon Saturdays to the local store, or Prowler ride around the farm. She could find an apple or pear when it fell from one of our trees, no matter where it landed! She LOVED her fruit! In 2011, Dos went to school for agility. She did great and was a fast learner. Unfortunately, due to my work schedule, we never got the chance to compete. 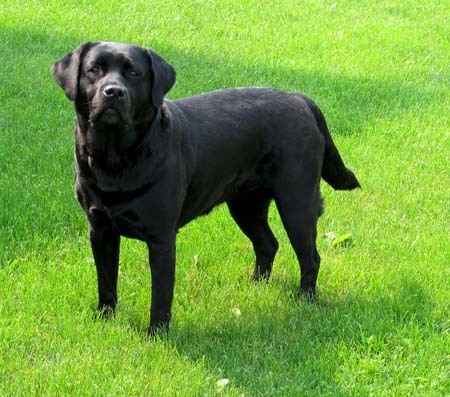 Early in 2013, she earned her AKC Title for: Canine Good Citizen (CGC)! 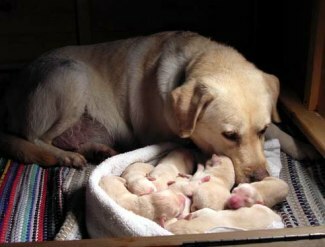 Early on the morning of August 14, 2017 Dos produced her last litter of 6 healthy yellow puppies - 2 girls and 4 boys. The proud father was: Belquest Doing It For The Ladies (aka Dew). This was the 3rd time for this cross and WHAT a litter it was! Dos really out did herself and boy, did she ever LOVE these puppies. We believe she knew they would be her last and she would be "Officially Retired" from the whelping box. Thank-you to all our clients and the many "Return Customers" who had asked for this litter to be produced. 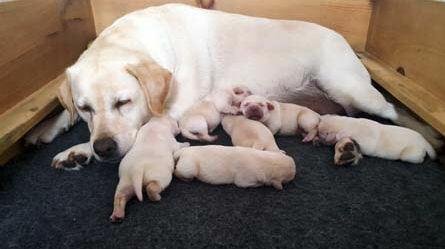 This litter is 3rd generation from our original Labrador Retriever, Oats. On Dec.15, 2017 tragedy struck us full force. Out of the blue, God called this beautiful soul back home. We are shocked, stunned and just plain heartbroken. Nothing but time, will soften the pain or shock of her passing. She will live on through her daughter Island Jada and her grandaughter, Island Samantha. 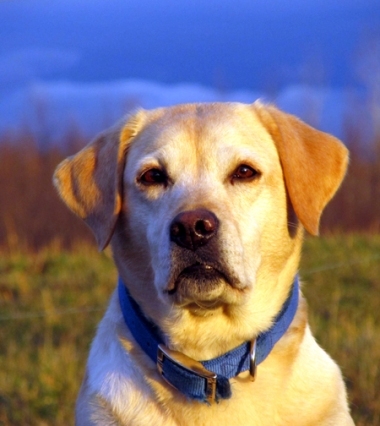 "Dodie Dog, Rest in Peace"
Your memory and the joy you brought, shall live on through your offspring. Run with glee, snapping jaws and your wonderful yellow hackles raised! Your Grandmother Oats, and Mother Uno, await! And I, Beautiful Girl, will see you again, one day. Duchess is the culmination of all our original dogs rolled into one. She is a daughter of Island Breeze, making her a granddaughter of Island Harley and a great granddaughter, to our original yellow female, Oats. She also has ties to Island Uno & Island Dos. Her sire is the well known and very good looking, CH Lobuff Hollyridge Osprey. Needless to say, Duchess has some BIG paws to fill! Duchess is a stout, medium sized dog. She has excellent bone, a ton of coat, a pretty head, nice deep chest and a Lap-a-dor personality. 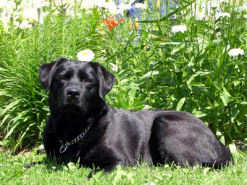 This compact dog is extremely athletic and loves to give Island Dos, Jada and her daughter Shelby, a run for the money! 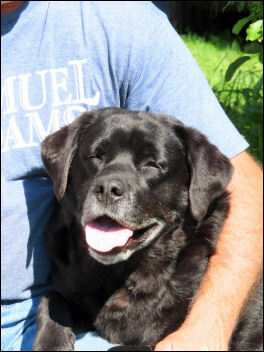 She loves swimming, truck and/or Prowler rides and her secret love is quiet time on the deck with lots of hugs. Oh! And she also loves the camera! Duchess has produced several very nice litters over the course of the last few years. We are hoping she will produce at least one more litter sometime in the next year. We currently have one of her daughters, Island Shelby. Shelby will carry on for her mom! Duchess whelped what may well be her last litter of pups on Jan. 1, 2019. It was a small but very healthy litter! 2 fancy females – 1 yellow & 1 black and 1 super chunky yellow male. Proud sire of these puppies is: Belquest Conclusion Stag Night aka “Stag”. This is “Stag’s” 1st litter and if it’s an example of what he will produce ….. WOW!!! Thank-you Belquest for your fast, easy service! “Stag’s” sire - AM/ENG Sh Ch Farnfield Topo Gigio JW ShCM - is the 2019 Westminster Kennel Club Best of Breed Winner!! 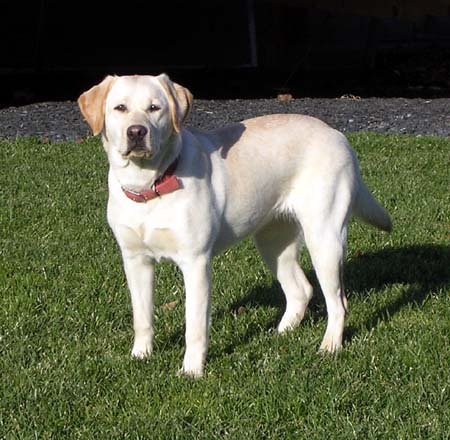 Jada is a daughter of Island Dos and a great, granddaughter of our first beloved Labrador, Oats. She is also granddaughter to Island Uno who we lost at the end of 2013. She is quick, extremely agile and a fast learner. We hoped she would love to play agility like her grandmother Uno, which she did but, alas, due to an injury to a toe, while playing with our other dogs, we decided it wasn't worth the risk to finish her training. Today, she remains sound and in excellent health. She is my side kick and has taken on the roll of making sure I am safe from all monsters that may lurk in the shadows........... I just LOVE this girl and all the weird things she does! Life without Jada, would be boring! Jada has had her second litter! It seems like everything went wrong - as it sometimes does - on the day of delivery. The sad result was only 2 live puppies but, WHAT puppies they are!! These puppies are the culmination of almost ALL our past girls and their sires!! 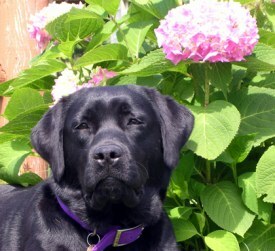 The very proud sire of these pups is: Mistyfield Hawksnest Soaring With The Stars - aka Teddy. 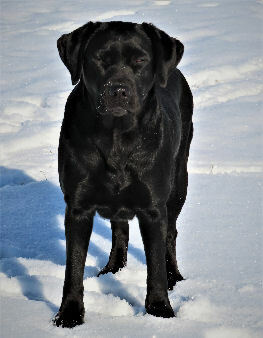 I personally would like to Thank both Betty Welles (Hawksnest Labradors) and Janet Nolan (Mistyfield Labradors) for producing Teddy and allowing us the chance to retrieve these wonderful genetics!! In the near future, both these puppies, Luna & George, will be heading home with their new families! We will miss them. They are the best mannered pups we've ever seen! 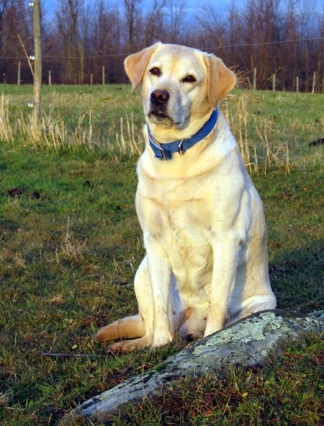 "Teddy" showing as a younger dog. What can I say about this little spitfire of a dog?!! Well, I can say, she is my husband's pick so, if she does something wrong, I can blame him! Shelby is a daughter of our Island Duchess and one of the very first puppies by her sire, Belquest It's All Or Nothin (aka Hoss). 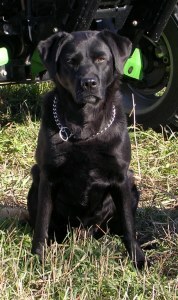 We kept Shelby because her sire line goes back to some of our original dogs. Shelby is proving to be an extreme athlete. She is quiet, a tad shy, yet has a quick witty personality! She adores water! Bring out the water hose and she's there! At the tender age of 3 months she would "attack" the water hose and continues to worry the heck out of it today! Shelby is, the official "babysitter" to any litter that is born. She LOVES the babies and will sit, watch and guard them when their mother goes outside. 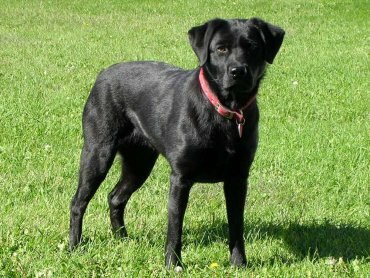 She is an Excellent mother and produced her first litter of black puppies in March 2017. Shelby whelped her second litter of puppies on June 3, 2018. There were 5 girls & 4 boys – all black! We were so EXCITED about this litter, that we kept a female for ourselves! The proud father was: Belquest Conclusion Stolichnaya (aka Stoli) is a young Chocolate male his first year of reeding. 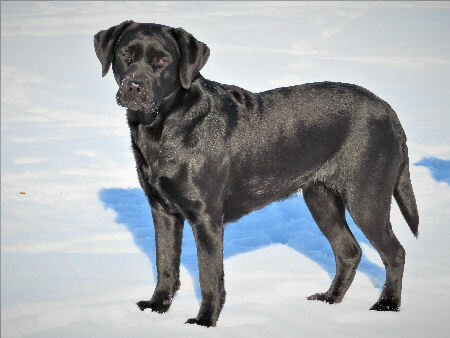 We are hoping that Shelby and Stoli’s daughter will be the start of our line of Chocolate Labradors! Sammi is from Island Jada's first litter! What a litter it was!! We were hoping to keep a black male as a future stud prospect but, alas, Jada/Miles had other plans and we ended up with a black girl who is turbo charged but, WICKED smart! Future agility dog?? Possibly as Island Uno is her great grandmother! Sammi is extremely intelligent, has excellent bone, a wonderful full coat, cute head, nice way of moving, super hip and correct tailset. She is a credit to both her parents. We look forward to taking this girl to some spring dog classes to see where she prefers to go. We are hoping for agility but, one never knows!! Stay tuned and watch this pretty girl grow!! Reese has the personality of a saint and her athletic ability is just unbelievable! Her leaps and bounds, and ice skating abilities leaves everyone holding their breath! She is our extreme athlete in waiting. She is correct, with excellent bone and a coat to die for! Her appearance is very feminine while her foot fall, is so soft & gentle, you will barely hear it. She has earned the nickname of: Stealth Dog!! Can’t wait to start training her for agility and possibly dock diving…………..
Reese is a bit of a, “step out of our box”. Her sire is a Chocolate. What this means is, Reese carries a Chocolate gene and can produce chocolate puppies if and when she is bred. We have had her color tested to ensure she did not inherit a yellow gene from her mother, Shelby. So, sit back and watch this spitfire of a dog grow!